This fall District 6440 is once again taking a fun approach to our annual Fall Seminar with a combination of the ABCs of Rotary, PR/Communications/Social Media, Membership and Grant Management Seminars. Come join us for the annual TAILGATE EVENT! Yes, in addition to the nuts and bolts of Rotary, we’ll have a little fun too! 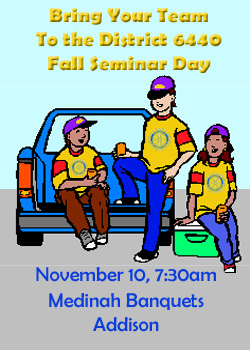 Wear your favorite sports team’s colors and join us for a “Pre-Game” breakfast buffet and fellowship with Rotarians from around the District before we get started with seminar activities. This year’s event will be held at Medinah Banquet in Addison on November 10th. So grab your team and huddle up for three great programs! Please plan on sending your team of at least four members from your club to ensure someone is at each of these sessions. Don’t leave your players on the bench – get them ENGANGED! Register Here. Click More for Schedule. Rotarians responsible for publicizing your club’s good works to the public and your own members!